we were driving home, and a propos of nothing (I've racked my brain trying to figure out what brought it on), I said to teh SO, "there is an episode of Looney Tunes or something like that with a little song that goes like Istambul, not Constantinople, with a really catchy hook". now, once upon a time, that'd be about as far as it got – I may try to remember more, or it it really drove me crazy, ask everybody I knew, be exceedingly annoying, hope that either the show or the song played at some time. – from around 1992 or so, I could have spammed some USENET groups (alt.tv.rec, alt.music.rec, alt.animation.rec) and there'd be a chance a fellow nerd with a better memory would cite the exact show; then we could group chat about how good shows used to be. – from around 1995 or so, I could have checked the Internet movie db, but I doubt I'd come across a TV episode back then. -from around 1999 or so, I could have checked that search engine everybody was talking about: would most likely get the exact show, wish I could see it again, and talk about how good shows used to be. in the early 90s, the song was used in the episode "Istanbul" of the Tiny Toons animated series. in less than two minutes I went from having a vague memory to be watching the show. on the plus side, there is a pile of Tiny Toon animated music videos in YT and they are not half bad. 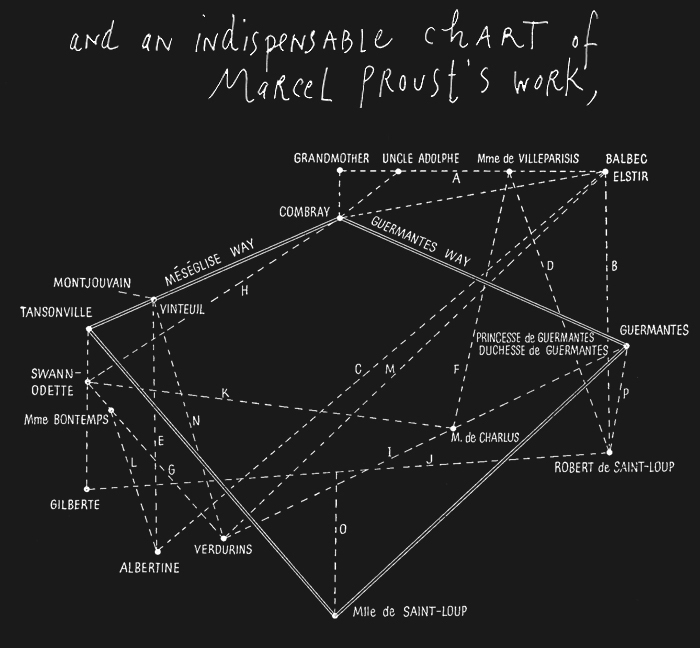 take my word for it as not-a-scholar-of-his-works-by-any-means-but-a-devoted-reader-of-M.-Proust, that this chart makes sense. I'm trying to imagine it in 3-D.
Monty Python’s sketch "The All-England Summarize Proust Competition"
the video (remix version) shows the influence of hip-hop in traditional latinoamerican music.